Before my last trip to Northern California in January, I visited McWay Falls in the Julia Pfeiffer Burns State Park on three separate occasions. Because my previous visits were part of much bigger trips, I could not choose the best time for visiting the falls. 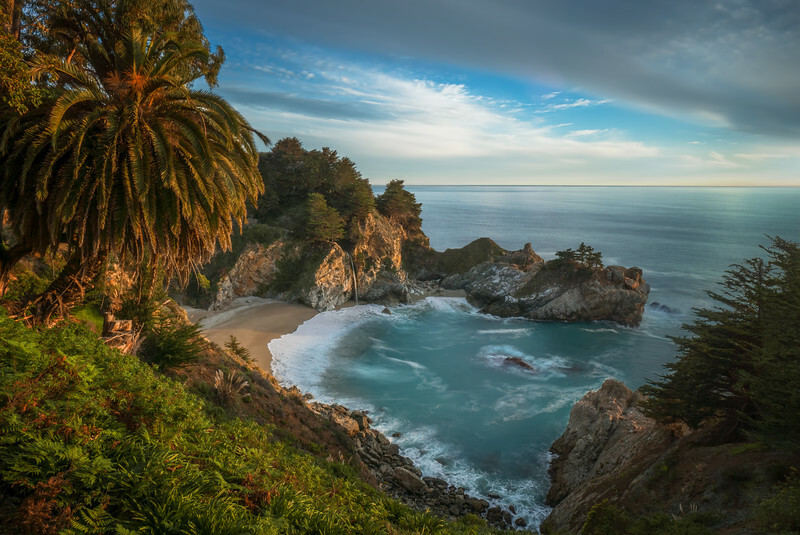 For all three visits, I was at Julia Pfeiffer Burns State Park in early afternoon with less than favorable light for landscape photography. Here, you can see the only decent photo I took from this location prior to my latest visit. This time was different. My flight from Hawaii to San Francisco was delayed; then, I got stuck in traffic on 101 around San Jose and, as a result, my entire schedule was shifted by a few hours. 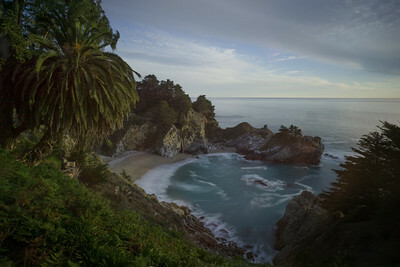 Finally, I was at McWay Bay at the right time, just before sunset. When I setup my tripod and prepared to start shooting, a group of 10-12 photographers arrived, making it very crowded. Since there is no direct access to the beach and the only place you can set up your gear is on the narrow McWay Waterfall Trail along the mountain, we had to tackle each other for the best spots (just kidding). I left half an hour before sunset so I had enough time to drive to the Big Sur Lightstation and photograph it during the golden hour. From the beginning, I was planning to use a long exposure technique to achieve the effect of smooth and silky water. I set the lens (sony 10-18) to the smallest possible aperture (f22) but it was not dark enough outside; the longest shutter speed I could get was 1/13, which was not long enough to achieve the desired effect. The only solution I could see was to use Neutral Density (ND) filter. With 10 stop Hitech ND filter I managed to achieve 6 seconds shutter speed exposure (image below). To produced final image, I used 4 photos in total. First, I blended together 3 bracketed shots (-1, 0, +1) in Photoshop with the help of transparency masks (for more details check my Review: “The Art of Digital Blending”). When I managed to create balanced image I placed 6 seconds exposure photo on the top layer in Photoshop and masked everything out except the water of the bay. Photoshop I opened 3 bracketed photos directly in Photoshop and placed each image on separate layer. Then, I used luminosity masking techniques to blend everything together. Topaz DeNoise was used to reduce digital noise (sky, snow). I am a Korean woman. Nice to meet you. Always a good meeting.